It's week two for our sew along! How is everyone doing with their blocks from week one? Don't forget to add to the Linky so that you will be eligible for a prize. This week we are sewing an old favorite called Shoo Fly. You will make one 9" block and three 6" blocks. For our bonus block, I made a Stiles and Paths block. It will measure 9 1/2"
I chose two light fabrics, two dark fabrics and 2 medium fabrics. You can mix it up any way you please. From the Large navy print, cut (2) 4" squares, and cut in half on the diagonal. 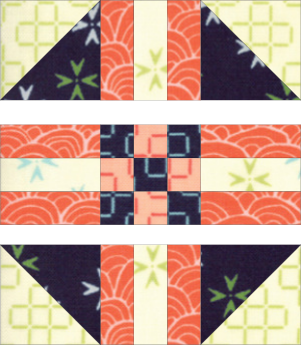 Pair up the background and the navy 4" squares, right sides together and cut in half on the diagonal. Sew with a 1/4" seam, press to the dark. Trim the HST blocks to 3 1/2". Pair up the peach 1 1/2" x 16 1/2" strips on each long side of the background strip. Sew with a 1/4" seam and press towards the dark. Now cut this long strip into four 3 1/2" squares. With the 1 1/2" peach and background squares, sew a nine patch block. When finished, it will measure 3 1/2" . Lay out your units so that they look like the diagram below. Sew together in rows. Or you can change the direction of the units in the block. Please link your Shoo Fly blocks with the Linky for this week....I love seeing your fabrics and blocks. If you post in IG, tag @punkydoodle and use the hashtag #happygoluckysal Thanks for particpating, and I hope you are having fun!